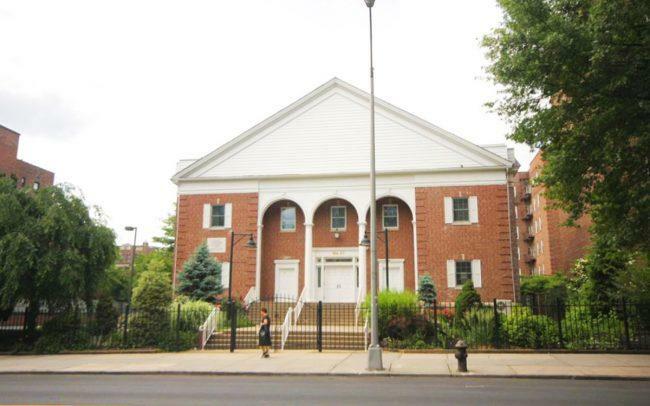 Developer Xin Xiang Lin is looking to building a residential complex on the site of a Flushing Mormon church. Xin filed a permit application to build an eight-story, 131-unit mixed-used building at 144-27 Sanford Avenue. The 113,000-square-foot property will be built on a 24,000-square-foot lot that sits between 147th Street and Parsons Boulevard. Plans call for 93,000 square feet of residential space, with apartments having an average size of about 710 square feet. The building will also contain 20,000 square feet for an unspecified community facility. The site will replace a two-story structure that was built in 1931. Demolition permits have yet to be filed. The site was owned by a religious order for the past seven decades. The Church of Latter Day Saints bought the property in 1994, records show. Before that transaction, the First Church of Christ Scientists owned the property. It’s unclear when the Christian Science church acquired the building. However, the organization was named in loan documents for the property dating back to the 1970s. Xin bought the church for $27 million last month. The Flushing-based investor is also part of a joint venture for an 84-unit condo project at 1587 East 19th Street in Midwood.